People have been keeping score at baseball games for decades. Whether you’re a proud parent watching your child, a scout attending a high school affair, or a fan watching your favorite professional team, keeping score is a breeze with this baseball scorekeeping sheet from Microsoft. With the baseball scorekeeping sheet, you can track all the action in a quick and efficient manner. The card is also customizable, so you can alter it in any way that would be better for your game day experience. This great baseball scorekeeping sheet is available on this page at no charge. 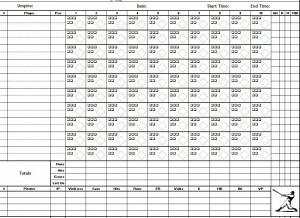 To download the complimentary baseball scorekeeping sheet, simply click on the link located in the page and it will open up in seconds. After downloading, save a copy to your computer or other device. There’s no reason to worry if you forget to save the sheet because you can return to this page and download it as many times as you need to. No matter how many times you download it, the cost will always be the same: FREE! The baseball scorekeeping sheet is a straightforward Excel document from Microsoft. The top of the sheet is reserved for game information, such as the teams, umpires, the date and time of game. The body of the baseball scorekeeping sheet is for all of the offensive stats. You can also keep track of how many pitches a batter sees by marking the corresponding boxes within each at-bat. Beneath the offensive stats is where you will total up the runs, hits, errors and runners left on base in each inning. Below this is where you will see the pitching stats. You can tally things such as hits, walks and strikeouts in this area. Finally, you can add the line score to the bottom of the sheet, which is created for up to 10 innings of action. Keeping score at a baseball game has never been easier thanks to the baseball scorekeeping sheet. Download and print the baseball scorekeeping sheet for free right here on this page today!